Did you know you can zipline right here in Port Elizabeth? No? Well now you do. 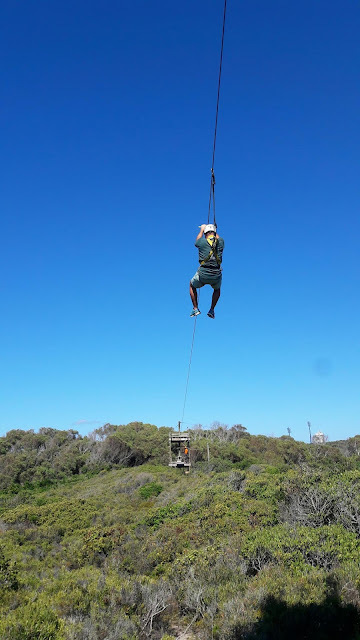 Pine Lodge has a three cable zipline as well as a high ropes course that is well worth the visit if you don't have the time to travel to the Addo or Tsitsikamma areas. I remember how people were moaning when they banned all driving on beaches back in 2002. 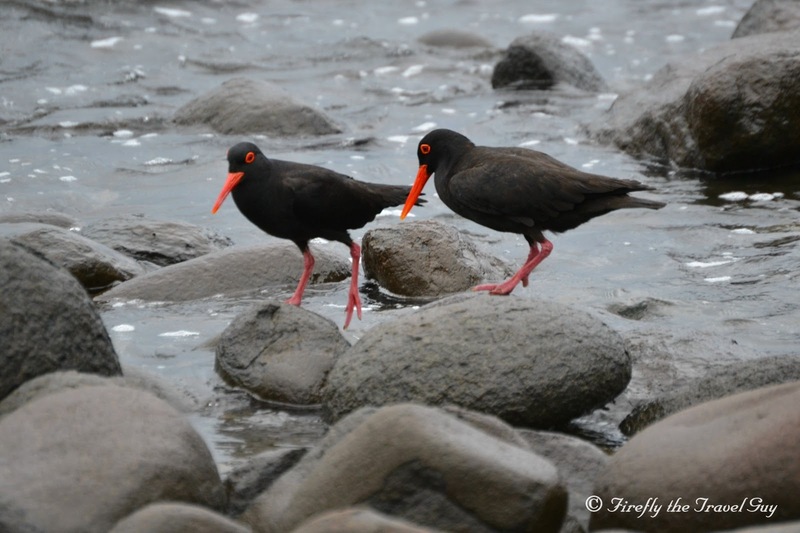 One of the reasons given for the ban was the Black Oyster Catcher and how vehicles driving on the beaches destroyed nests, and thus eggs, as well as killed chicks. The pro beach driving group blew this off as rubbish yet research have shown an increase in Black Oyster Catcher numbers since the ban has been implemented. A win for conservation and the environment. 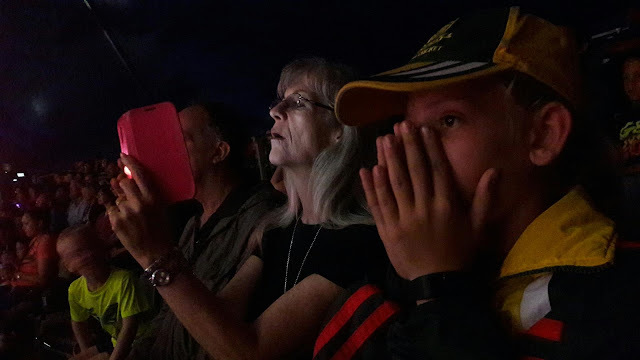 I got to attend the final performance of the Great Moscow Circus in Port Elizabeth tonight (Sunday 26 Feb) before the pack up and move on to Durban. Wow, what a performance. I commented earlier in the week how I felt that it is affordable to take a family to see the show and I stick to that statement, but after seeing the setup and all the equipment I realise why it is so expensive. Just a pity that so many people would not be able to experience what we experienced last night. 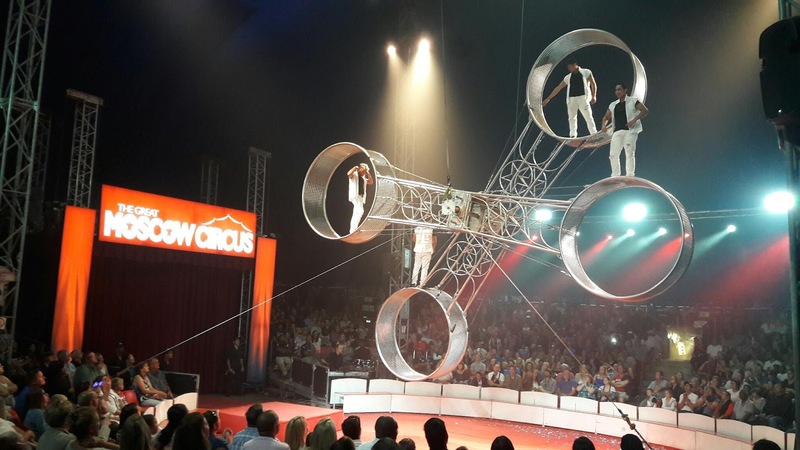 I think the first thing to point out is that this is a modern circus so there are absolutely no animal acts. Everything are done and features people and their abilities. Although each and every act was exceptional in it's own way, there were three headline acts that really stood out. The opening act featured trampolinists who absolutely amazed with their performance. The second was the four guys on the revolving circles (first picture) and was probably my favorite act of the night. 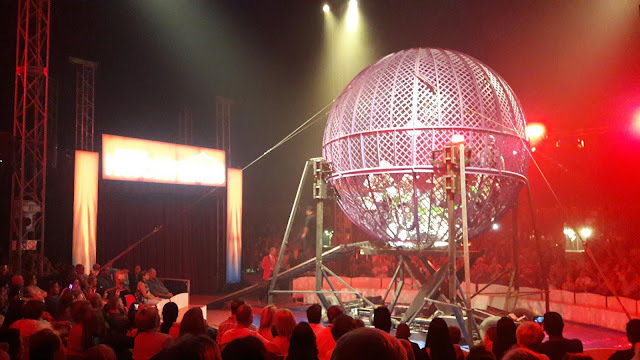 The closing act featured one, then two, then three, four and ultimately, for the first time in South Africa, five motorcycles in a metal globe. A globe which then opened and had three circling in the top section and two in the bottom. ... even closing her eyes a couple of times. A big thanks to my friend Poekie who was able to organise me tickets at the last minute. Jy is a vriendin duisend. 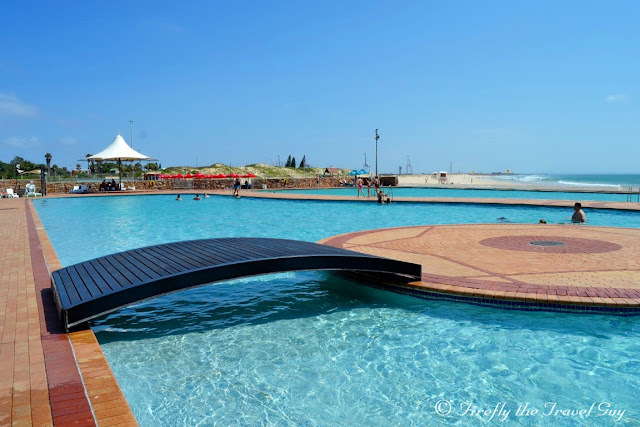 Just a footnote about this and other events that come to Port Elizabeth. It's really a great pity that bloggers aren't seen as "mainstream media" enough when media invites are sent out when something like this comes to town. Newspapers and radio stations are included and get to promote the event after first hand experiencing it yet bloggers, with what is often a very good reach of their own, don't. I know of a few bloggers who bought tickets and went, then posted about it on their various social media platforms, but why doesn't PR companies see them as influential enough to invite them along with traditional media as they do in Cape Town and Johannesburg? I shared a number of photos and videos on various platforms in addition to this post, but in all essence it's really just showing people how a good time we had as it was the last show and it wouldn't be able to influence anybody to go and buy a ticket for a subsequent show. Who knows, cause I don't? Anyway, enough of that. With summer in full swing, the Wild Coast Holiday Association has just launched a destination promotion video promoting the Wild Coast as a winter destination for the upcoming winter season. 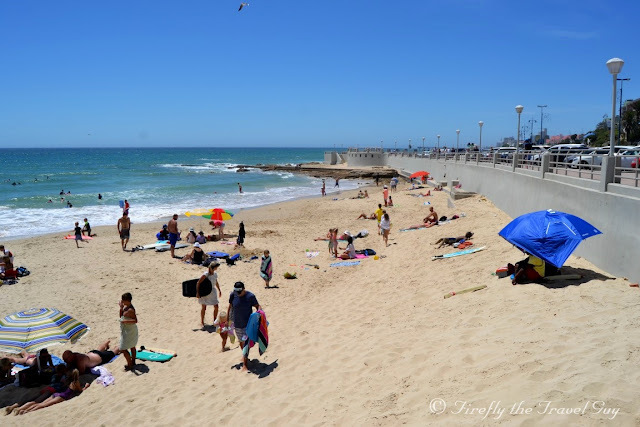 I'm sure a lot of the Wild Coast locals would ask you what winter is as they have stunning weather over this period and it's a great time to head east from Port Elizabeth to go and explore the Wild Coast. 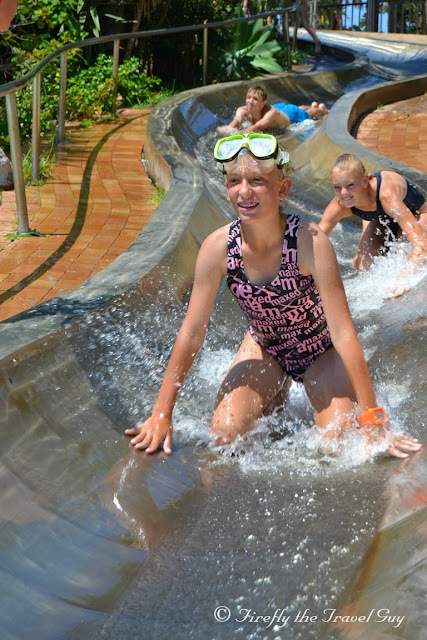 On Saturday Miggie had her birthday party at MacArthur Pool and the kids spent most of the day on MacArthur's slides. Even though they really are kiddie slides, even I decided to go down once or twice... or five times. Who's counting? 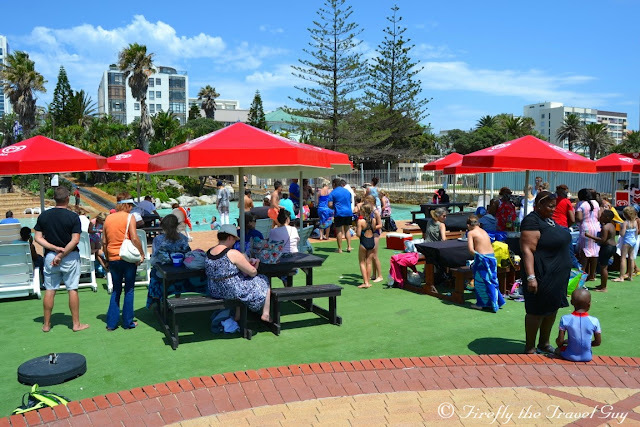 On Saturday we had Miggie's birthday party at MacArthur Baths on the beachfront. 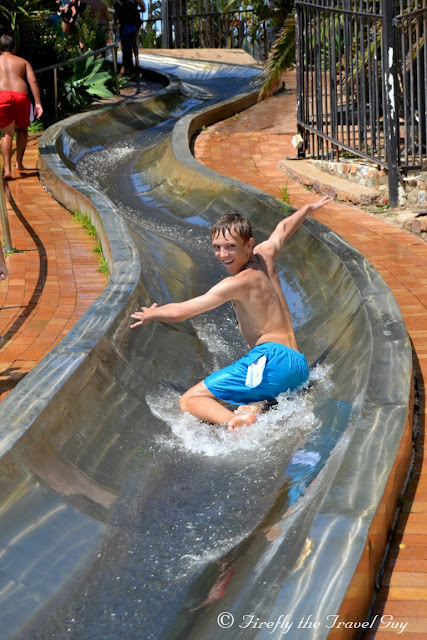 At R40 an adult and R20 for kids 12 and under it really is a bargain venue to have a party. We didn't book before hand and just took up minimum space to put down our stuff, but there were four other parties that booked and had tables set and reserved for them. The complex can also supply party packs at at additional charge but the great part is that you can bring your own food and drinks in for the kids and parents (as long as you don't bring in alcohol or glass). So next time you have a kiddies party to host, there are no need to go and do it at an expensive party venue. MacArthur's is the perfect venue. Flat Rocks was named so for the exposed reefs of flattish rocks that you find along this piece of Algoa Bay's coastline. 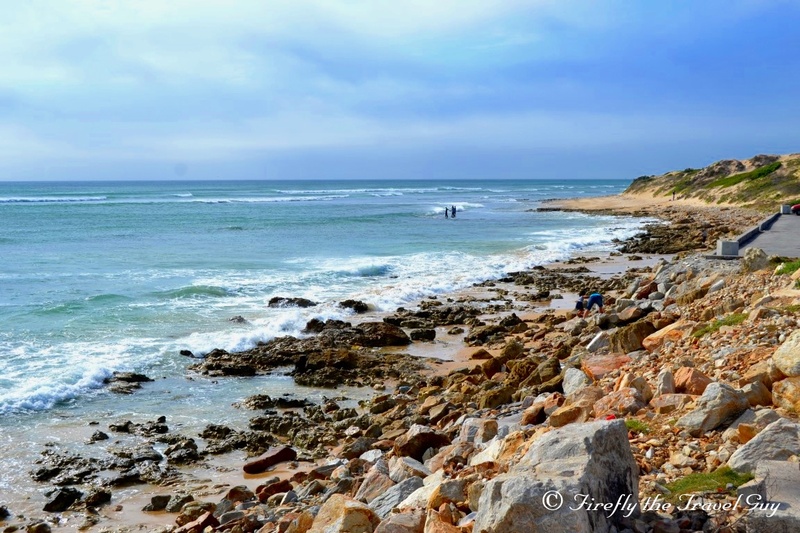 But when you visit at high tide there aren't any visible flat rocks so you won't have any idea what the locals are talking about. We spent the day at MacArthur Baths and I spotted this group of kids busy with a beach cleanup on King's Beach. 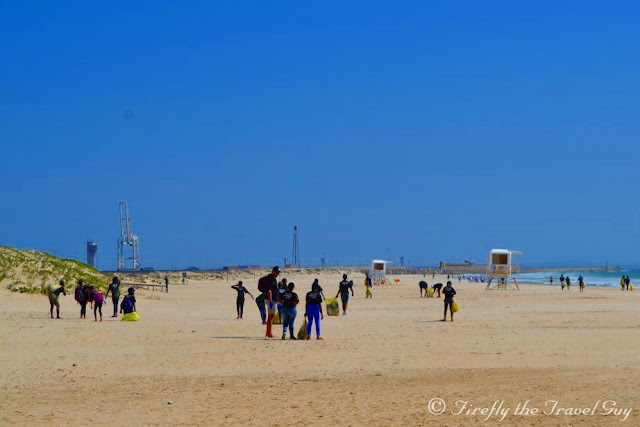 Well done guys on doing your part to keep our coastline clean and beautiful. 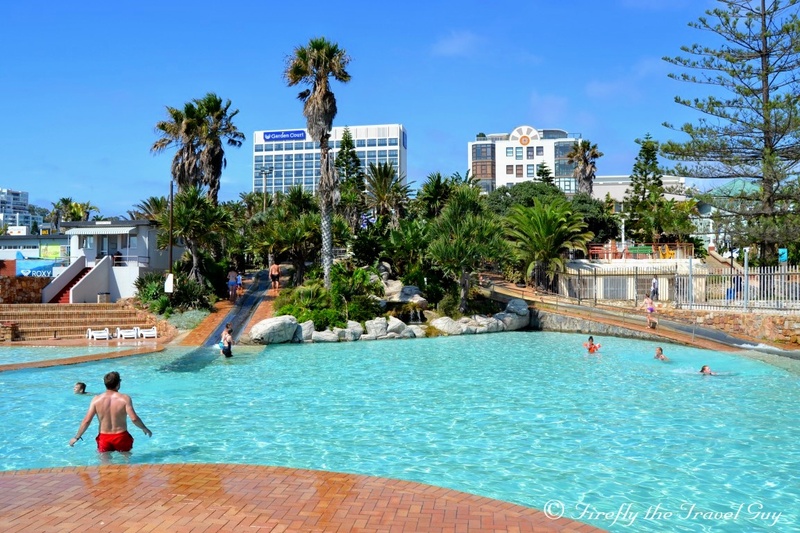 I was looking for a video to post for today's Video Friday post and found this stunning video by Sun International promoting the Boardwalk Hotel and Casino complex. More importantly, they are promoting Port Elizabeth along with the Boardwalk. Whoever commissioned this video and worked on the project gets that everybody has to be a destination marketer as much as a product marketer as visitors first select a destination before they choose at which establishment they want to stay. Well done Sun International on a brilliant video. Today's post is a more personal one. Why? Because I can and I feel like bragging a bit. When your daughter's idols are Kagiso Rabada, Hashim Amla, AB de Villiers and Imran Tahir then you know she's a cricket fan. 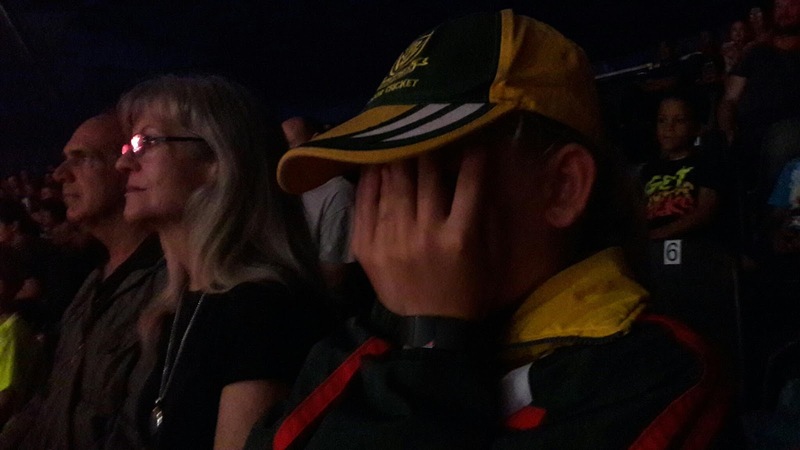 The difference from other girls who are just cricket fans though is that mine has a set of pads, gloves, a helmet and two bats (one for outdoor cricket and one for indoor cricket) lying around her room along with her girly stuff. When her favorite shirt is her Lighting Legends Indoor Cricket team shirt then you know I have a cricketer on my hands. Miggie has been playing cricket since grade one and at 11 (nearly 12) she's mixing it up with the boys in the Newton Park Primary School's under 13 team. 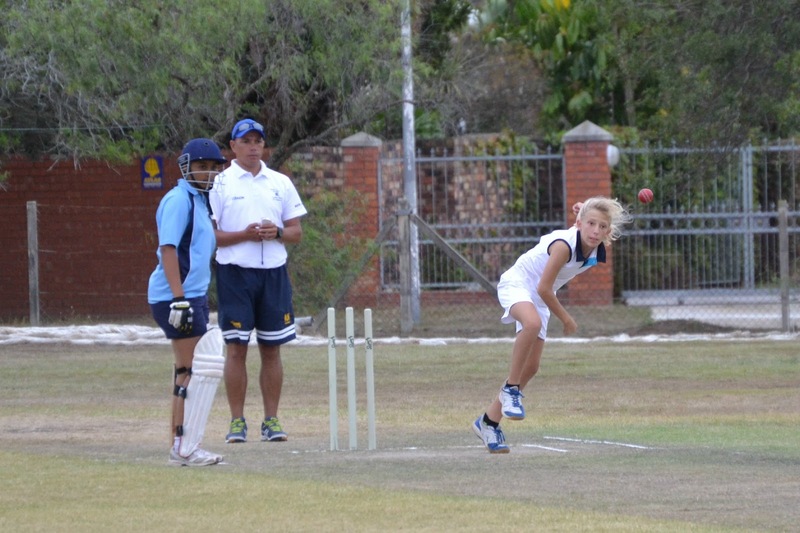 She's also started playing for DF Malherbe High School's Girls Cricket First team (under 19) along with playing in the Indoor Cricket junior league. In the photo she's bowling in the game between DF Malherbe and Linkside High School this week where she took 2 for 8 in her 4 overs, taking her tally to 5 wickets in three games. To say I'm a proud dad is an understatement. 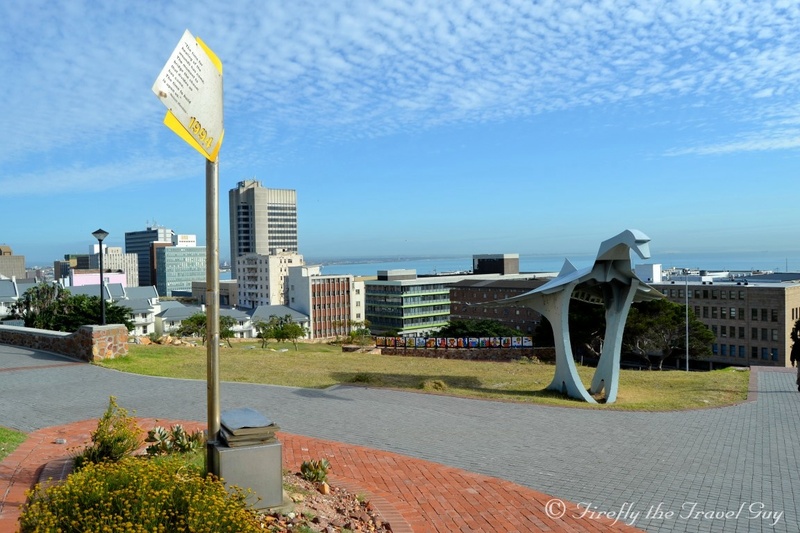 Standing at the top of the Donkin Reserve stands a lone woman on a pedestal holding a chair while looking across the square. 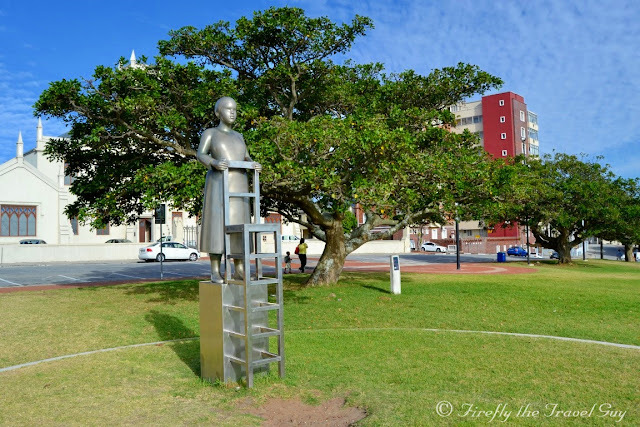 She is one of the art pieces which is part of Route 67 and is the work of well known artist Anton Momberg. Do you know what she represents? Take a guess. 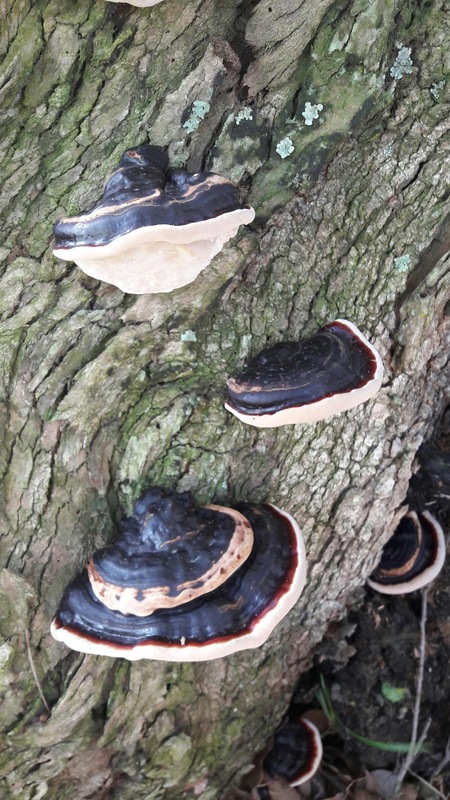 I will come back tomorrow to place the answer as part of this post below. 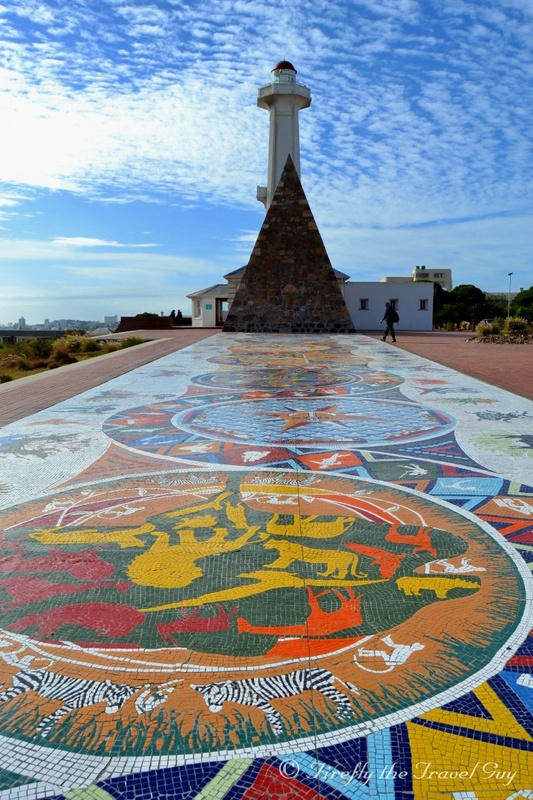 Isn't the 470 square meter mosaic on the Donkin Reserve just the most awesome piece of mosaic art in the city? 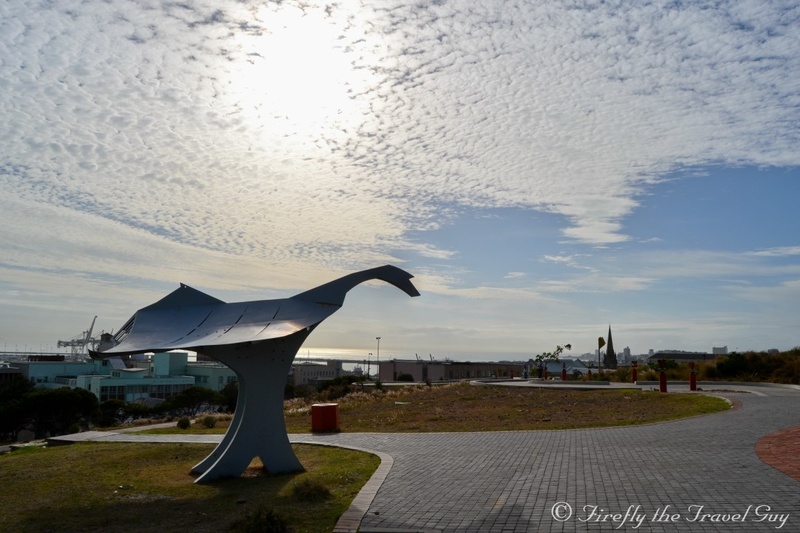 The piece represents the multi-cultural, the heritages, the diverse histories and the abundant fauna and flora that characterises the city and province. One of the Route 67 art pieces that gets the most discussion by visitors is artist Mxolisi Dolla Sapeta's bird-like statue. 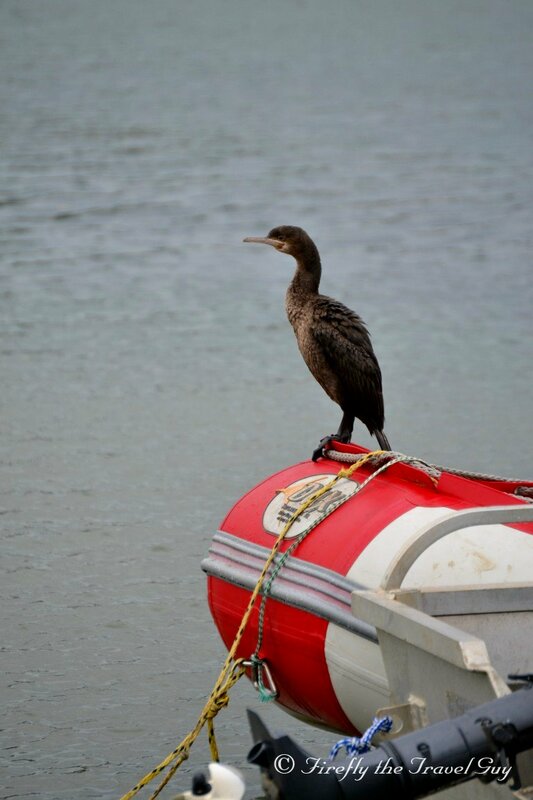 The Fish-Bird looks like a UFO that has landed and visitors would be excused if they looked around for little green men running around. 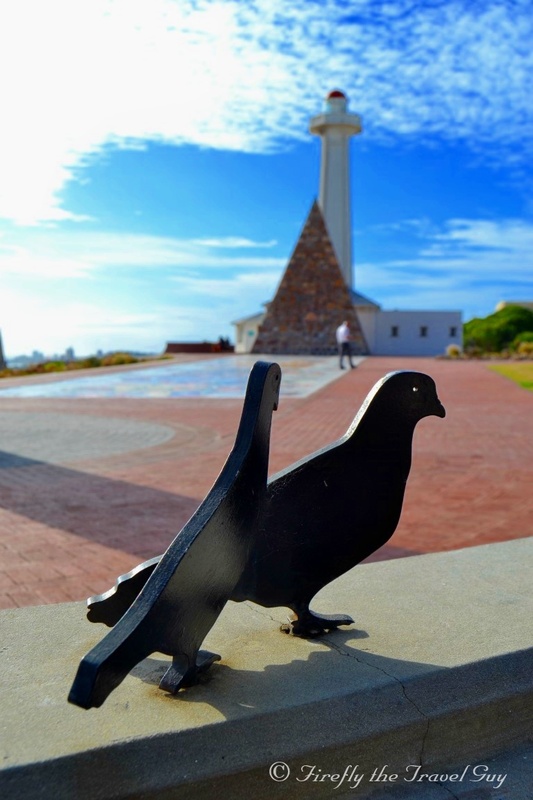 The Fish-Bird represents the fish in Algoa bay and the birds up on the Donkin Reserve and has returning back to the Donkin to take ownership of this transforming site. Visitors to the Donkin Reserve will notice a number of memorials located next to the lighthouse building in a memorial garden made up of spekboom and euphorbia. 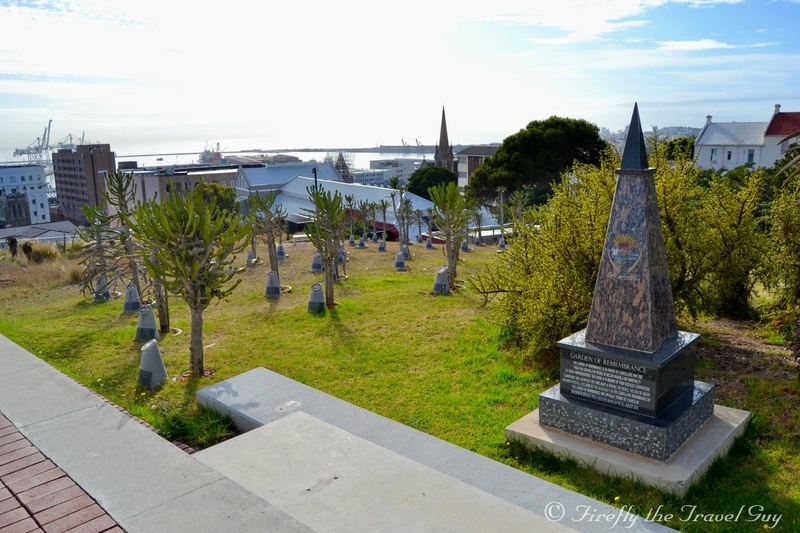 This section of the Donkin Reserve has been dedicated to the memory of municipal councilors who have died while serving the city. The garden was unveiled to remember 52 (at the time of unveiling) councilors from different political backgrounds who died while in office and who's deaths range from illness to car accidents and even assassination. I came across this video of a mass line dance that was done at the Nelson Mandela Metropolitan University on 21 February 2013. Don't know how I haven't seen it before, but I just have to share it with you for today's Video Friday post. These words were spoken by Nelson Mandela in 1994 and is on display along Route 67 on the Donkin Reserve. Words which are as appropriate today as it was back in 1994. The Mandela figure at the head of The Voting Line piece on the Donkin Reserve has become a very popular photographic subject since it's installation as part of Route 67 either on it's own or with people posing next to it. It is sad though that this is the only Mandela figure that visitors get to see with the only two others ones I know of being a life-size figure standing inside City Hall and the Madiba Shirt piece on the university campus. 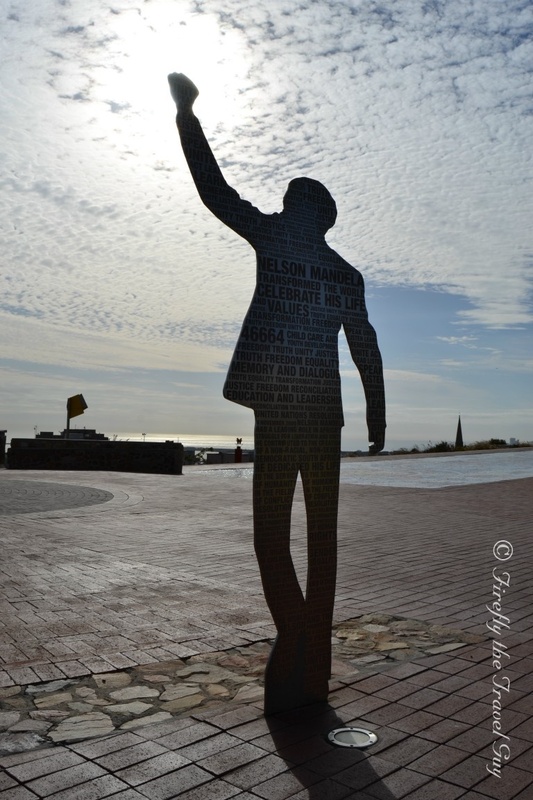 Port Elizabeth really needs a big Mandela statue or sculpture somewhere in an accessible spot where tourists and visitors can get to see and take photos with it. Something along the lines of the Mandela statues in Sandton City or Bloemfontein. And I'm not the only one so let's hope somebody, either the municipality or private sector, actions the idea sooner rather than later specially seeing that we live in a metro named after Nelson Mandela. Even though I've been to the Donkin Reserve so many times (I don't want to say hundreds of times but probably can), I still enjoy walking around the reserve and look at the Route 67 art pieces. It really is one of Port Elizabeth's ultimate iconic sites. 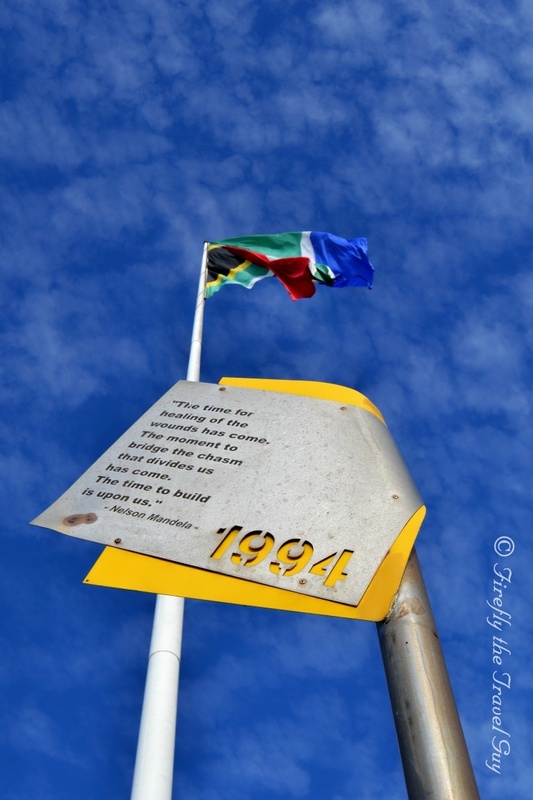 There are so many pictures being taken of The Voting Line on the Donkin Reserve but often it is of the sculpture as a whole and the little details are missed. Like this pair of pigeons sitting on the wall. 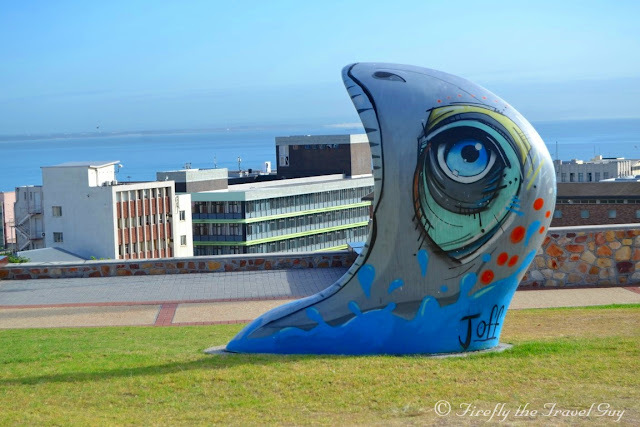 The Donkin Reserve is one of Port Elizabeth's iconic tourism sites and combines history and public art. 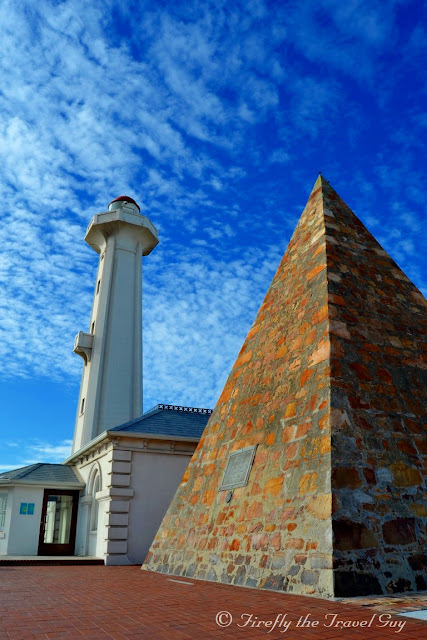 The pyramid, called the Donkin Memorial, was commissioned by Sir Rufane Donkin in 1820 as a memorial to his wife Lady Elizabeth Donkin after whom he also named the town. The lighthouse, actually called the Hill Lighthouse, was built in 1861 as a warning signal to approaching ships. Although not in use anymore it offers one of the best views anywhere in the city from the top. 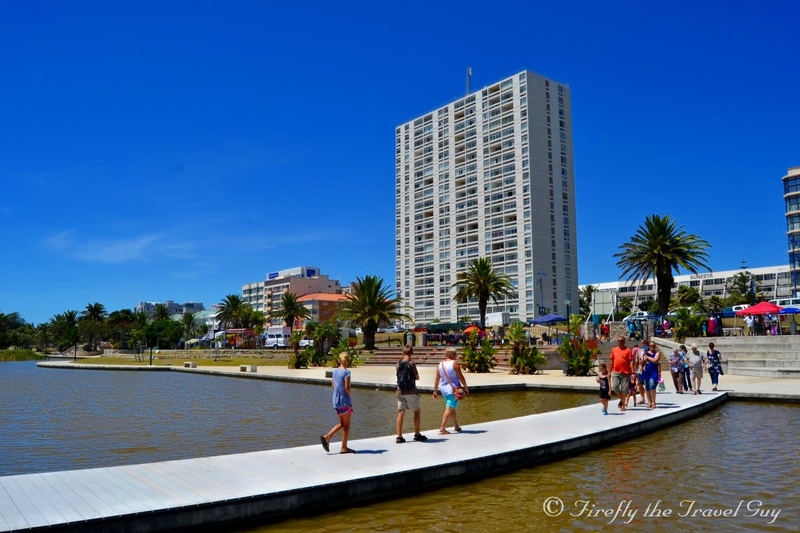 Today's Video Friday post is a video by toasted2010 showing some nice aerial footage of the Donkin Reserve and Summerstrand area filmed in December 2013.